Loved it! Great time and perfect house. Can't wait to come back again. All the staff we met were very knowledgeable, polite and helpful. We appreciated that. We liked being close to everything. We enjoyed the farmer's market just down the street. We managed to get to the Lazy Susan Cafe and took in the Library book sale. Gull's Nest makes everything I mention accessible. 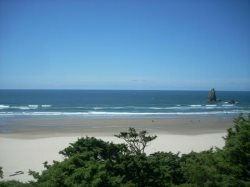 The Cannon Beach Team exemplifies customer service. They are extremely friendly and helpful. The staff is the entire reason we called to rent a second year in a row. I am sure the rental market is extremely competitive and there are a lot of places we could rent from but the staff at CBVR make such a huge difference to the overall experience we have had time and again! The hemlock is a beautiful property in close proximity to so many places and activities that we enjoy. The property was beautiful, comfortable, and really felt like home! We would certainly consider staying there again! Staff was easy to work with via both by phone and email. They were so friendly on the phone and in person. They were great, very nice and welcoming. My wife and I had a wonderful experience, at what we call our "Ocean Song" home. We often frequent Cannon Beach, sometime just for the day. We have stayed at a hotel if visiting for more then one day. Staying in this home was far superior to an already great stay at the near by hotel. The management and home owners care for this home was obvious. I tend to find the details of an unkept home, both in cleanliness and maintenance. I found nothing to probe. We plan on coming back as soon as possible.